The esophagus is the hollow organ between the pharynx and stomach, which serves the transport of the food crushed by chewing. The esophagus is a tubular hollow organ of around 25-28 cm in length, which extends in projection on the spinal column from around C6 to Th10. It is located in the superior and posterior mediastinum between the trachea and the orta, and over a short stretch, it fits closely to the left atrium. The terminal section of the esophagus before the esophageal hiatus is also called gastroesophageal vestibule. Superior esophageal constriction (pharyngoesophageal constriction, cricoid constriction): Esophageal opening in the upper entry area behind the cricoid cartilage. This is the narrowest point of the esophagus, which has an internal diameter of 14-15 mm. A circular sphincter muscle (superior esophageal sphincter) closes this constriction. Medial esophageal constriction (constriction of the thoracic part, bronchoaortic constriction): Constriction of the esophagus by the trachea and the aortic arch, approximately in the middle of the esophagus. Inferior esophageal constriction (diaphragmatic constriction): Passage of the esophagus through the diaphragm with formation of a cardiac sphincter muscle. The phrenoesophageal ligament fixates the esophagus elastically in the diaphragmatic constriction. The esophagus is closely fit to heart - especially the left atrium - from behind. Cervical part: Inferior thyroid artery (from the thyreocervical trunk). Thoracic part: Aorta and right intercostal artery. Abdominal part: Esophageal branches of the left gastric artery (from the celiac trunk). The veinous supply is provided by the esophageal veins, which flow to the azygos vein and the hemiazygos vein. From there, they lead to the superior vena cava. There are connections between the right gastric vein and the portal vein - so-called portocaval anastomoses. The esophagus has an autonomously working nervous system (enteric nervous system) like other parts of the intestines. This autonomous nervous system is functionally responsible for the coordination of the swallowing act. Additionally, the activity of the enteric nervous system is modified by the sympathetic nervous system and parasympathetic nervous system. Postganglionic sympathetic fibers from the cervicothoracic ganglion of the thoracic sympathetic trunk - together with postganglionic fibers of the cranial thoracic trunk ganglia (thoracic ganglia II-V) - jointly lead to the esophageal plexus. The activation of the sympathetic nervous system leads to an inhibition of the esophageal peristalsis, and simultaneously to an inhibition of the secretion activity of the esophageal glands. inferior part of the esophagus: vagus nerve. The stem of the left and right vagus nerve is closing in towards the esophagus below the tracheal bifurcation, and it forms the esophageal plexus in the adventitia. In the distal section, the vagal trunks originate from this plexus]] and pass through the esophageal hiatus together with the esophagus. Due to the embryonic torsion, the left vagus nerve is lying on the anterior side of the esophagus and forms the anterior vagal trunk. Whereas, the right vagus nerve forms the posterior vagal trunk on the dorsal side of the esophagus. An activation of the parasympathetic nervous system leads to an augmentation of the esophageal peristalsis and increases the glandular secretion. The sensitive innervation is provided by the fact that the vagus nerve (or the recurrent laryngeal nerve) contains afferent fibers coming from the esophagus, which forward viscerosensitive information (eg. expansion, pain) from the esophagus to the central nervous system. The esophagus is schematically characterized by the same wall structure as all other sections of the gastrointestinal tract. There is a submucosal layer of connective tissue, and a muscular layer (muscularis) provides for the targeted transport of the food to the stomach via contractions of the smooth muscles (peristalsis). The mucosa is composed of a multi-layered, non-keratinized [[squamous epithelium], where the excretory ducts of the esophageal glands are spread in. While the muscularis consists of striated muscles in the upper third, the lower third only consists of smooth muscles. In the middle third, you can find striated muscles as well as smooth muscles, while the proportion of smooth muscles grows toward aboral direction. The esophagus serves the targeted transport of the food into the stomach. Via complex neuronal interconnections, the aboral parts of the esophagus contract slower, so that the transport can only go towards the stomach under physiological conditions. 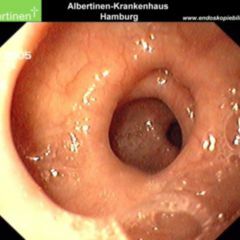 In the non-filled sections of the esophagus, the walls are so close to each other that the lumen collapses and the content is enclosed from above and below. The diseases of the esophagus are manifold. There can be hemorrhage (e.g. from esophageal varices), motility disorders, ruptures, carcinoma, or congenital defects of the esophagus. 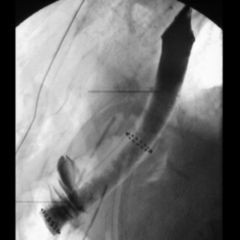 Another very frequent finding are swallowed objects (esophageal foreign body). 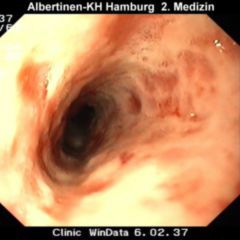 One disease with a lately increasing number of cases is the reflux of acid chyme from the stomach into the distal parts of the esophagus, with consecutive damage of the mucosa (reflux esophagitis). This can cause the so-called Barett's esophagus.